This article is the result of various experiments aimed at improving uWSGI performance and usability in various areas before the 2.0 release. We want our RPI to gather frames from the Eyetoy and stream them to various connected clients using websockets, using a HTML5 canvas element to show them. The Eyetoy captures frames in YUYV format (known as YUV 4:2:2). This means we need 4 bytes for 2 pixels. By default the resolution is set to 640x480, so each frame will need 614,400 bytes. Once we have a frame we need to decode it to RGBA to allow the HTML5 canvas to show it. The uWSGI stack is composed by a mule gathering frames from the Eyetoy and writing them to the uWSGI SharedArea. Workers constantly read from that SharedArea and send frames as binary websocket messages. The project at: https://github.com/unbit/uwsgi-capture shows a very simple plugin using the Video4Linux 2 API to gather frames. Each frame is written in a shared area initialized by the plugin itself. The procedure requires about 13 minutes. If all goes well you can clone the uwsgi-capture plugin and build it. You now have the capture_plugin.so file in your uwsgi directory. captureinit(), mapped as the init() hook of the plugin, will be called automatically by uWSGI. If the –v4l-capture option is specified, this function will initialize the specified device and will map it to a uWSGI sharedarea. We want a mule to run the captureloop() function. This time we have bound uWSGI to HTTP port 9090 with a mule mapped to the “captureloop()” function. This mule syntax is exposed by the symcall plugin that takes control of every mule argument ending with “()” (the quoting is required to avoid the shell making a mess of the parentheses). If all goes well you should see your uWSGI server spawning a master, a mule and a worker. Time to write our websocket server sending Eyetoy frames (you can find sources for the example here: https://github.com/unbit/uwsgi-capture/tree/master/rpi-examples). This function suspends the current request until the specified shared area (the ‘zero’ one) gets an update. As this function is basically a busy-loop poll, the second argument specifies the polling frequency in milliseconds. 50 milliseconds gave us good results (feel free to try with other values). This is a special utility function sending a websocket binary message directly from the sharedarea (yep, zero-copy). The first argument is the sharedarea id (the ‘zero’ one) and the second is the position in the sharedarea to start reading from (zero again, as we want a full frame). 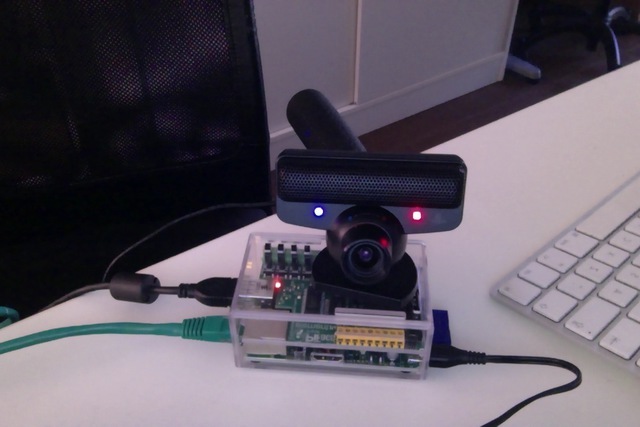 ./uwsgi --plugin capture --v4l-capture /dev/video0 --http-socket :9090 --psgi uwsgi-capture/rpi-examples/eyetoy.pl --mule="captureloop()"
Connect with your browser to TCP port 9090 of your Raspberry Pi and start watching. While you watch your websocket stream, you may want to start another browser window to see a second copy of your video. Unfortunately you spawned uWSGI with a single worker, so only a single client can get the stream. Like this up to 10 people will be able to watch the stream. Now, magically, we are able to manage 10 clients with but a single process! The memory on the RPI will be grateful to you. Why are we using the SharedArea? The SharedArea is one of the most advanced uWSGI features. If you give a look at the uwsgi-capture plugin you will see how it easily creates a sharedarea pointing to a mmap()’ed region. Basically each worker, thread (but please do not use threads with Perl) or coroutine will have access to that memory in a concurrently safe way. In addition to this, thanks to the websocket/sharedarea cooperation API you can directly send websocket packets from a sharedarea without copying memory (except for the resulting websocket packet). We would need to allocate the memory for $chunk at every iteration, copying the sharedarea content into it and finally encapsulating it in a websocket message. With the sharedarea you remove the need to allocate (and free) memory constantly and to copy it from sharedarea to the Perl VM. There are obviously other approaches you can follow. You could hack uwsgi-capture to allocate a second sharedarea into which it will directly write RGBA frames. At the time of writing, the uWSGI PSGI plugin is the only one exposing the additional API for websockets+sharedarea. The other language plugins will be updated soon. The RPI board is really fun to tinker with and uWSGI is a great companion for it (especially its lower-level API functions). As an exercise left to the reader: remember you can mmap() the address 0x20200000 to access the Raspberry PI GPIO controller... ready to write a uwsgi-gpio plugin?